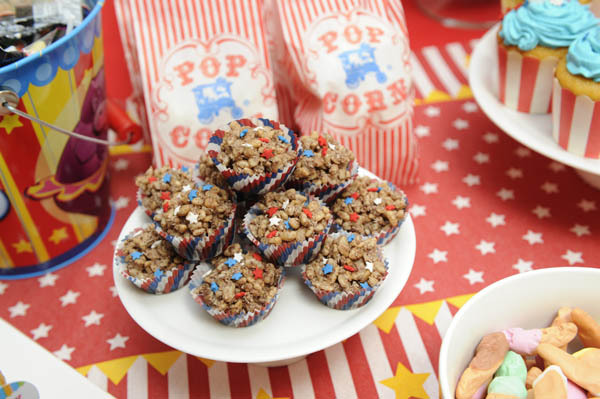 Showcase your party on Babyology! 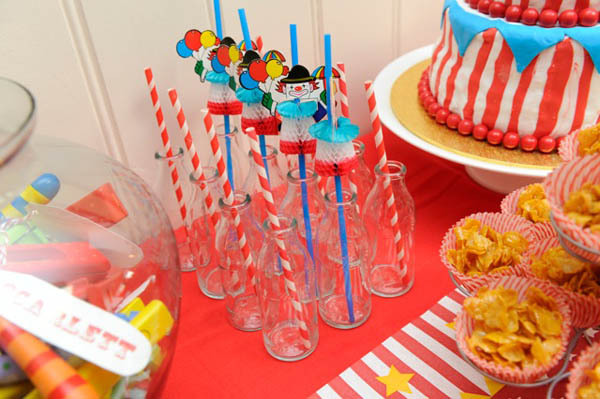 Babyologists, it seems you love a good party as much as we do! So we’re launching a new section today where we show off your birthday parties in all their amazing splendour. 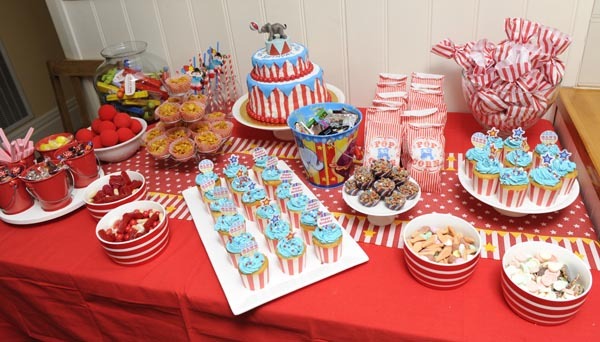 We kick-start our new section with the vintage circus party I threw for my son William’s first birthday a few weeks ago. I wanted to create something very special and magical for his special day, and I think I managed to do just that! 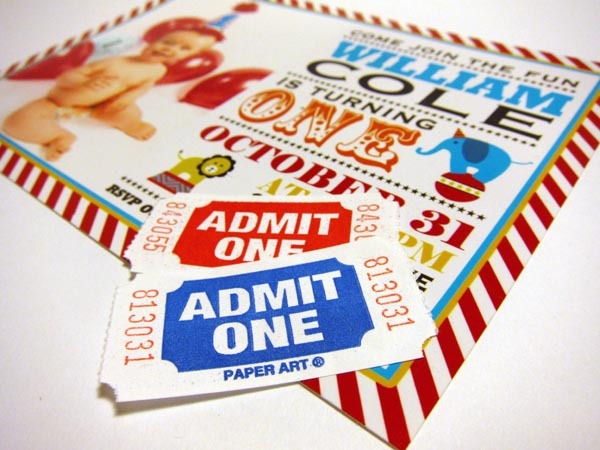 To make sure guests got into the spirit of the day, I included carnival-style admission tickets with the vintage circus invites that were created by supremely talented designer Amber from Announcing You on Etsy. I especially love how she customised the invites to suit my red and blue party colour scheme. Here’s my sweets table. We had a hard time keeping the kids away from this until after the birthday barbecue lunch! Only a fraction of the goodies I made were put on the table to keep it from looking overcrowded and I simply replenished as guests munched! Because first birthdays are just as much for the adults as they are for the kids, I made sure to include lots of retro delights for the grownups! So I made mini chocolate crackles, decorated with red, white and blue star cachous that I found at Cakes Around Town. I used the same cachous on the cupcakes, topped with a yummy buttercream icing. The retro papers for the honey-joys and chocolate crackles came from Etsy shop Hey Yo Yo, along with the popcorn bags and straws. The red and white cupcake wrappers were from Paper Eskimo, as well as the table runner. 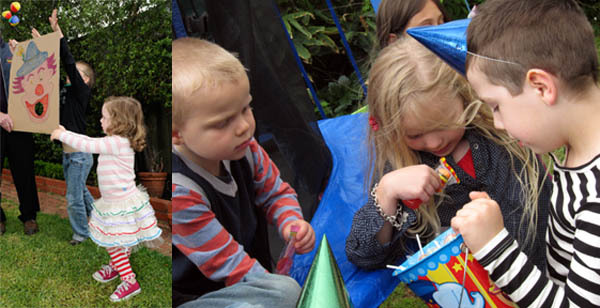 The circus-themed Schylling tin bucket, which holds the prizes for the party games, came from a favourite nearby children’s boutique, Milk Bottle. 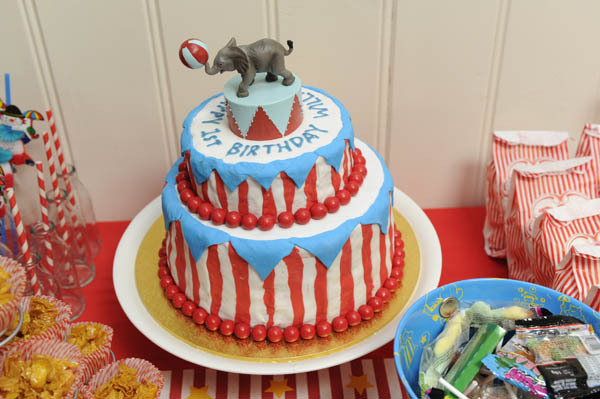 The darling elephant atop the cake – which took a staggering four hours to decorate (my fingers were blue for two weeks!) – was another Etsy find – as was the special custom-made hat on the birthday boy’s head. I adapted the cake from More Cakes for Kids, the Australian Women’s Weekly’s sequel to its best-selling party cake bible. This is only the fourth cake I’ve ever baked and decorated so I was pretty pleased with the way it turned out! 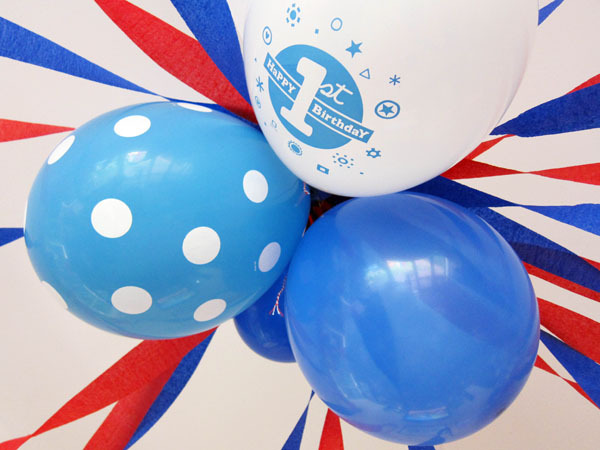 I decorated the party room with red and blue streamers to match the cake, along with dozens and dozens of helium balloons, including lovely patterned ones from Paper Eskimo that I picked up from Little Styles. I intended stringing Paper Eskimo paper bunting outside in the back garden but ran out of time! Luckily, I had these great pre-strung Liberty party buntings on hand to match from Hip Hooray. 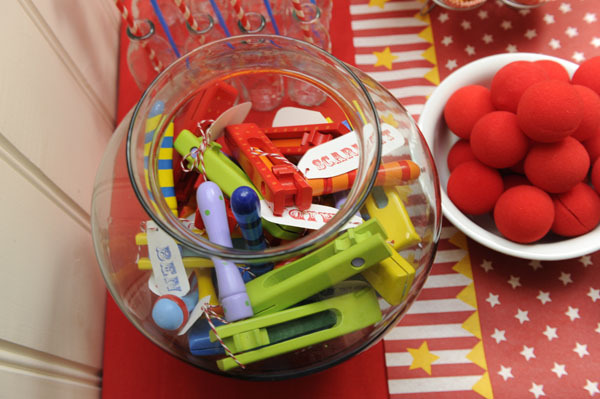 For party favours, the little guests took home wooden animal bellringers and spinning crackers from Eleganter, as well as mixed lollies in darling little striped milkbar-style bags from Lark. I found these fun foam clown noses on Ebay and people helped themselves – perfect for candid funny snaps! 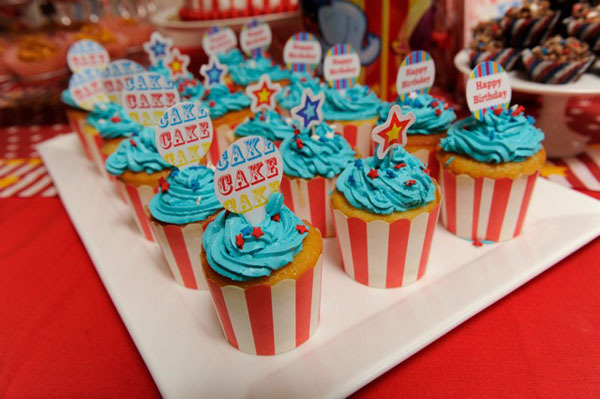 Lark was also the source for a lovely fabric Happy Birthday bunting in the party room and the circus-like toppers on the cupcakes. The star-shaped toppers were from Wilton. 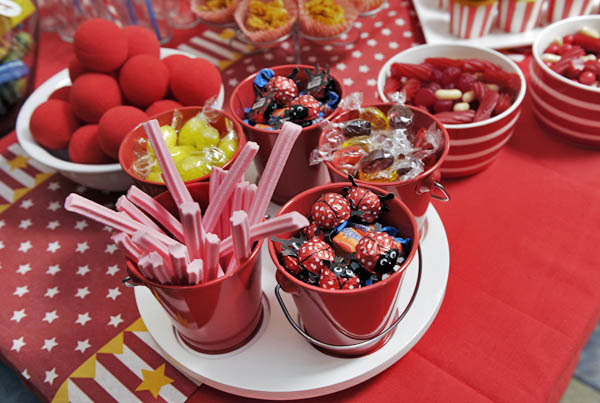 I found the red and white striped bowls that I filled with lollies for a bargain two dollars apiece at Kmart, of all places! The sweet craft turntable that I wrote about recently was commandeered to hold even more lollies. 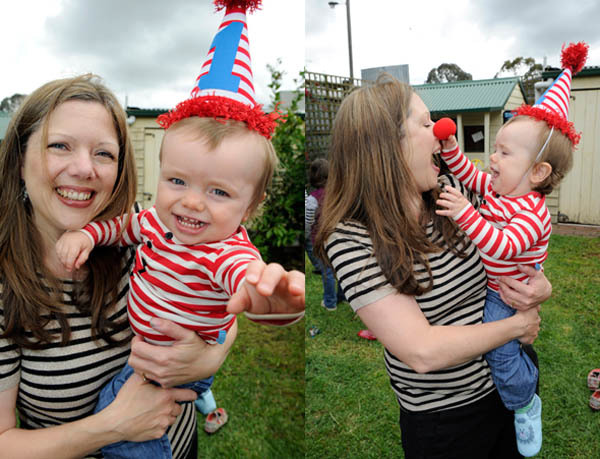 Thank goodness for Melbourne’s fickle weather because Will wore a darling red and white striped carnival tee from Heavenly Creatures’ circus range that had inspired my party theme after we featured them here earlier in the year! His big brother and sister also wore the carnival tees in different colours. In keeping with the retro theme, we played old-fashioned party games including egg and spoon races, sack races, three-legged races and every kid’s favourite – chasey! The biggest hit was the clown toss game – my father-in-law drew a colourful clown on a huge piece of board and cut out a hole for the mouth. The kids lined up for turns at tossing juggling balls through the hole. They loved it!